Noodle is having a rough couple of days. The rules keep getting in the way of his fun! Rules for this and rules for that. There are so many rules – too many rules! And Noodle struggles because he doesn’t think many of them actually apply to HIM! Can’t he just have a rule free day? This book is part of thee Responsible ME! series from Boys Town Press. Laugh alongside Noodle as he describes the variety of rules he deals with daily. 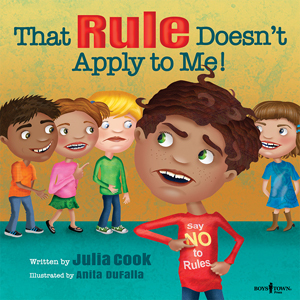 Will Noodle’s mother and teacher convince him that rules are meant to help, not harm, him?